For many of us, one of our earliest childhood memories is being read to by our parents. The stories my parents read to me as a child helped shape me into the person I later became, and I credit my own abilities as a writer to being read to at an early age. As I got older, I began begging my father to take me to the local bookstore so that I could pick out whichever book I wanted. I would spend hours sitting Indian style in the children’s section of the store, a stack of books next to me, getting lost in stories about fairies and mermaids and witches and ghosts. Now, some twenty years later, I look back on those memories fondly, and i’m grateful that my parents introduced me to books at an early age. There are countless benefits of reading to your child. Studies show that reading aloud to your child can build literacy and broaden their vocabularies, and also teaches children to be good listeners. Additionally, allowing children to choose their own books and encouraging them to sound out the words can increase their interest in learning. Here are just a few of the many benefits of reading to your child. One of the biggest benefits of reading to your child is that it can help better prepare them for school. By kindergarten or first grade, most children should be able to read on some level, and reading to your child at home will help prepare them for this. Reading to your child at an early age can also help them become more advanced readers, as well as develop advanced vocabulary and literacy skills, helping them thrive in the classroom. Being that being read to helps children become better listeners, this can be extremely beneficial when they get to school, and their teachers will appreciate it as well. Reading to your child can also set them up for success at school, and children who are strong readers are more likely to get good grades. While you’re preparing for potty training, make sure you’re reading to your child as well! As I mentioned earlier, reading to your child can help make them better listeners. 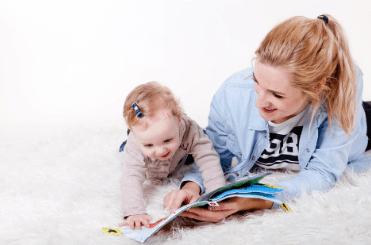 In addition to this, reading to your child can also increase their concentration, since they will learn to sit for extended periods of time and focus on what is being read to them. When your child starts being able to read on their own, they will be able to focus on what they are reading and not get distracted, which is especially important when they start school. Reading to your child can help form incredible bonds, which is another reason every parent should make it a point to read to their child. Young children rely solely on their parents to teach them and help them grow, and reading to your child will strengthen that bond even more. Curling up with a book and reading aloud to your child is an essential way to not only help your child learn to read on their own, but it also shows them how to listen and sit contently for an extended period of time.